If ESP was fitted, this supermini may have had something to really trumpet. COTY throws up 'difficult' cars every year. In 2006 it was Holden's long-wheelbase Statesman and Caprice models that had the judges arguing; in 2007 the BMW M3 coupe. 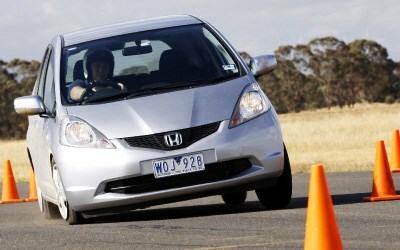 In '08 Honda's Jazz took up the cudgels on behalf of controversy. While the discussions lacked the volatility of the last couple of years, they were no less intense. No-one, absolutely no-one, had issues with the fundamental concept of the second-generation Jazz. It's a car that successfully builds on the original's packaging brilliance while remedying its dynamic flaws. The problem is stability control - or the lack of it. The Jazz has been launched in Australia without ESP despite it being offered in other markets. Known as VSC in Honda speak, this acknowledged life-saver is around 12 months away, awaiting calibration with the five-speed automatic transmissions now fitted optionally to the Oz-spec Jazz. Okay, there are plenty of superminis on sale today that don't offer stability control. However, newer arrivals at the top of the market such as the Mazda 2 and the Ford Fiesta (the latter will be eligible for the 2009 Wheels COTY) do. And there's no doubt that Jazz sits at that top end of the segment, in terms of pricing, quality and engineering. "If the Jazz had ESP, even as an option, it would be an instant COTY favourite," was how Peter Robinson saw it. ESP or not, judged purely in terms of Function, the second-gen Jazz was clearly the best car present at COTY 2008. That's because it retained the original's fundamental tall-boy monobox concept, fitting the fuel tank under the front seat to maximise interior versatility. Still less than four metres long but 30mm wider, the Jazz is simply extraordinary in the amount of loading, luggage and seat space it can create. "You could fit an entire lounge room worth of Ikea inside," marvelled Sean Poppitt. "It's a bloody Tardis. Huge inside for its external dimensions." That obviously makes the Jazz attractive as a city car, but that's not its only trick. There are heaps of storage nooks throughout the cabin, including substantial space under the cantilevered rear seat. And in city driving, its slim pillars and massive glasshouse ensured the driver has no problems manoeuvring through tight spots. "Now I know how a goldfish feels looking out of its bowl," exclaimed Jonathan Hawley. The Function criterion also encompasses driving experience, and here it's obvious the Jazz has made great strides. The original was criticised for remote steering and a jiggly ride, something the new car has largely overcome. Not only is it competent, it's confident and even fun. In addition, the cabin was significantly quieter in terms of road noise than several of its highly-fancied rivals, including the Mazda 6. Engine noise was more prominent, though, highlighting the effort the small donks had to put in. That particularly applied to the base model 1.3-litre GLi, especially when mated with the optional five-speed automatic transmission. The 1.5-litre engine in the VTi and VTi-S coped better in either manual or auto form, the latter aided by quick-shifting paddles on the steering wheel. "The 1.5 is a fantastic revvy little engine, similar to the 1.3, but with more urge and therefore more enjoyable," noted Bulmer. Jazz did well in Efficiency and Environment too, its small engines swallowing frugal amounts of fuel and emitting very modest levels of carbon dioxide. Technology was not its strong suit, however, presenting as a thoroughly orthodox mechanical combination. The first- generation CVTs are gone, the 1.3-litre engine is upgraded significantly while the improved suspension remains a combination of struts up front and a torsion-beam rear. With pricing stretching from $15,990 to $23,920, the Jazz looks mildly over-priced, even though our cars come from Thailand. So the Value equation was rated only mid-field. Such impediments weren't going to prevent the Jazz's march to business end of the Wheels COTY process. But the lack of stability control was - and it did.